"This is a strange combination of ingredients that creates a very refreshing, flavorful one-plate meal! It is super fast and easy to prepare. It is also extremely versatile - use what you have and like. This dish can be adapted to be vegetarian or vegan-friendly." Bring a large pot of lightly salted water to a boil. Cook spaghetti in the boiling water, stirring occasionally until cooked through but firm to the bite, about 12 minutes. Drain and return spaghetti to pot. Whisk coconut milk, white wine, lemon juice, olive oil, garlic, sugar, salt, red pepper flakes, and black pepper in a small saucepan over medium heat; simmer until flavors combine, 5 to 6 minutes. Stir chicken, tomatoes, bean sprouts, basil, parsley, and green onions into pasta; cook over low heat until warmed through, 3 to 5 minutes. Add coconut sauce; stir to combine. 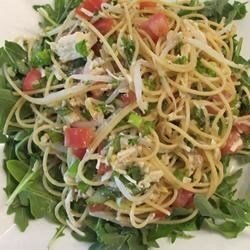 Serve pasta over a bed of arugula. Sprinkle with lemon zest. I used a full can of coconut milk. Poured the sauce over leftover pasta and let stand for 15 minutes. Topped with fresh prawns. Awesome ! Great for leftover chicken- needed more salt.